Starbucks Doubleshot Espesso. Enjoy the high quality, premium espresso experience you expect from Starbucks whenever and wherever you want it. The 6.5 ounce can is best served chilled. No mess, no fuss. It gets you going! 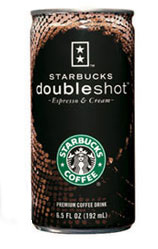 Starbucks Doubleshot Espresso and Cream, 6.5 oz cans. Serve Chilled.